These are the sour strips I used for my "ribbon". I found them at Shopko. (Walmart and Target did NOT have them.) Dorothy used Airheads for her ribbons so you could do that as well. I even saw some XL Airheads at Maverik that were already blue and red striped! The ribbons for the real medals this year are royal purple in honor of the Queen's Jubilee, so I also think it would be cute to do purple Laffy Taffy. (Maverik also has those in big honkin slices.) Pretty much... you have tons of options for the ribbon. Use whatever you want. Lay your cookies out on a paper towel and spray them with gold Duff spray. Look at my picture and you can choose whether you'd rather spray the chocolate side or the plain side with writing on it. I did about 3 coats and let them dry a bit between each because I wanted a really true gold color. When dry, store in an airtight container. 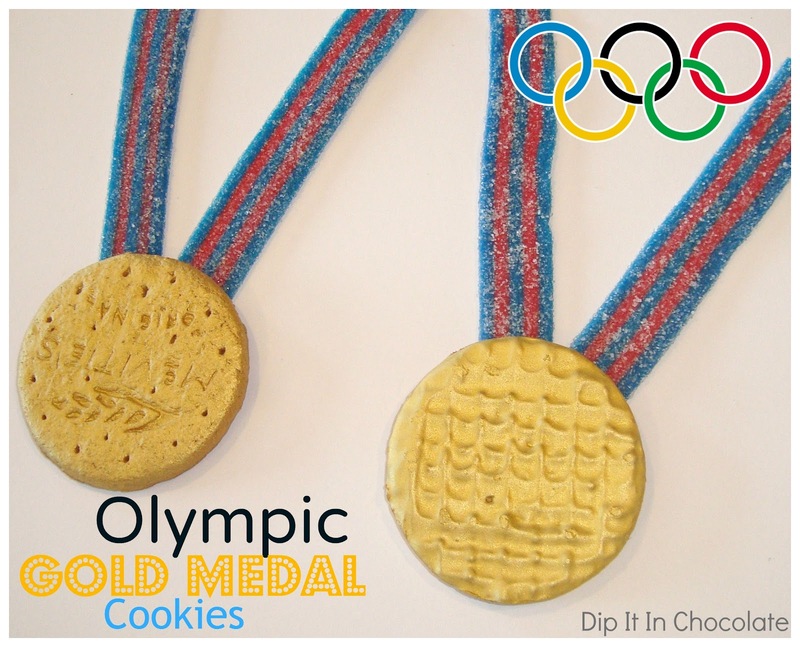 When almost ready to serve, lay cookies out on serving plate and tuck two "ribbons" into the top of each medal. You can actually attach them with melted chocolate/candymelts/candywriter or royal icing if you want. 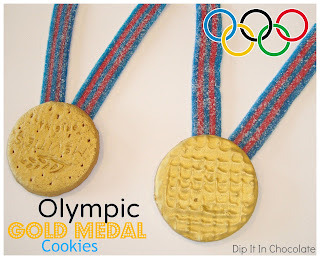 I think they are cute as is but you can also add something to the medal if you want, using pieces of candy or fondant. Wear it to the grocery store and tell strangers you are an Olympic medalist. Then flounce away. Gold Cake Spray!?! That sounds amazing. Can't wait for Opening Ceremonies! Dorothy, thanks for the cake spray tip!